Scurvy is a condition caused by a lack of vitamin C (ascorbic acid) in the diet. Signs of scurvy include tiredness, muscle weakness, joint and muscle aches, a rash on the legs, and bleeding gums. In the past, scurvy was common among sailors and other people deprived of fresh fruits and vegetables for long periods of time. Scurvy is very rare in countries where fresh fruits and vegetables are readily available and where processed foods have vitamin C added. Vitamin C is an important antioxidant vitamin involved in the development of connective tissues, lipid and vitamin metabolism, biosynthesis of neurotransmitters, immune function, and wound healing. It is found in fruits, especially citrus fruits like oranges, lemons, and grapefruit, and in green leafy vegetables like broccoli and spinach. In adults, it may take several months of vitamin C deficiency before symptoms of scurvy develop. Currently, the recommended dietary allowance (RDA) for vitamin C is 50-60 mg/day for adults; 35 mg/day for infants; 40-45 mg/day for children 1-14; 70 mg/day during pregnancy; and 90-95 mg/day during lactation. The body's need for vitamin C increases when a person is under stress, smoking, or taking certain medications. A lack of vitamin C in the diet is the primary cause of scurvy. This can occur in people on very restricted diets, who are under extreme physiological stress (for example, during an infection or after an injury), and in chronic alcoholics. Infants can develop scurvy if they are weaned from breast milk and switched to cow's milk without an additional supplement of vitamin C. Babies of mothers who took extremely high doses of vitamin C during pregnancy can develop infantile scurvy. In children, the deficiency can cause painful swelling of the legs along with fever, diarrhea, and vomiting. In adults, early signs of scurvy include feeling weak, tired, and achy. 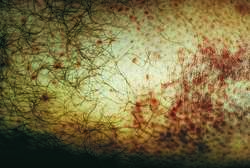 The appearance of tiny red blood-blisters to larger purplish blotches on the skin of the legs is a common symptom. Wound healing may be delayed and scars that had healed may start to break down. The gums swell and bleed easily, eventually leading to loosened teeth. Muscle and joint pain may also occur. Scurvy is often diagnosed based on the symptoms present. A dietary history showing little or no fresh fruits or vegetables are eaten may help to diagnose vitamin C deficiency. A blood test can also be used to check the level of ascorbic acid in the body. Adult treatment is usually 300-1,000 mg of ascorbic acid per day. Infants should be treated with 50 mg of ascorbic acid up to four times per day. Treatment with vitamin C is usually successful, if the deficiency is recognized early enough. Left untreated, the condition can cause death. Eating foods rich in vitamin C every day prevents scurvy. A supplement containing the RDA of vitamin C will also prevent a deficiency. Infants who are being weaned from breast milk to cow's milk need a supplement containing vitamin C.
Stein, Jay H., editor. "Ascorbic Acid (Vitamin C) Deficiency." In Internal Medicine. St. Louis: Mosby, 1998. Ascorbic acid — Another term for vitamin C, a nutrient found in fresh fruits and vegetables. Good sources of vitamin C in the diet are citrus fruits like oranges, lemons, limes, and grapefruits, berries, tomatoes, green peppers, cabbage, broccoli, and spinach. Recommended dietary allowance (RDA) — The daily amount of a vitamin the average person needs to maintain good health. a condition due to deficiency of ascorbic acid (vitamin C). Symptoms of infantile scurvy include poor appetite, digestive disturbances, failure to gain weight, increasing irritability, and bruises scattered over the skin. Severe deficiency may cause changes in bone structure. The only adults in the United States likely to develop scurvy are older people who live alone and neglect their diet. In adults, scurvy causes swollen and bleeding gums, looseness of the teeth, rupture of small blood vessels, and small bruises on the skin. Later symptoms may include anemia, extreme weakness, soreness of upper and lower limbs, tachycardia, and dyspnea. Treatment of scurvy consists of supplying the missing vitamin in prescribed doses, and supplying the proper diet, including fresh fruits and vegetables. When this is done, the symptoms quickly disappear. Fruits and vegetables that are rich in vitamin C include grapefruit, oranges, lemons, limes, cantaloupes, strawberries, raspberries, turnips, raw cabbage, potatoes, and tomatoes. 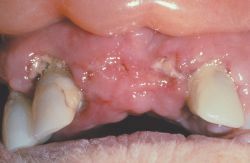 A disease marked by inanition, debility, anemia, and edema of the dependent parts; a spongy condition sometimes with ulceration of the gums and loss of teeth, hemorrhages into the skin from the mucous membranes and internal organs, and poor wound healing; due to a diet lacking vitamin C.
/scur·vy/ (sker´ve) a disease due to deficiency of ascorbic acid (vitamin C), marked by anemia, spongy gums, a tendency to mucocutaneous hemorrhages, and brawny induration of calf and leg muscles. A disease caused by deficiency of vitamin C, characterized by spongy and bleeding gums, bleeding under the skin, and extreme weakness. severe ascorbic acid deficiency. It is characterized by weakness; anemia; edema; spongy gums, often with ulceration and loosening of the teeth; a tendency to mucocutaneous hemorrhages; and induration of the muscles of the legs. Treatment and prophylaxis of the disease consist of administration of ascorbic acid and inclusion of fresh vegetables and fruits in the diet. Also called scorbutus. See also ascorbic acid, citric acid, infantile scurvy. Scorbutus, vitamin C deficiency Nutrition A condition characterized by weakness, anemia, gingivitis, skin hemorrhage due to ↓ vitamin C in diet, which rarely occurs in developed nations, but may be seen in older, malnurished adults. See Rebound scurvy, Vitamin C.
A disease marked by inanition, debility, anemia, edema of the dependent parts, a spongy condition (sometimes with ulceration) of the gums, and hemorrhages into the skin and from the mucous membranes; attributed to a diet lacking sufficient vitamin C.
A form of scurvy that sometimes follows the prolonged use of condensed milk, sterilized milk, or proprietary foods that do not contain supplementary vitamin C.
This condition is characterized by anemia, pseudoparalysis, thickening of the bones from subperiosteal hemorrhage, ecchymoses, nonpitting edema, and a tendency toward fractures of the epiphyses. Ascorbic acid deficiency symptoms caused by discontinuation of megadoses of vitamin C.
A deficiency disease caused by an inadequate intake of vitamin C (ascorbic acid). This vitamin C is needed for the formation of stable COLLAGEN; deficiency leads to weakness of small blood vessels and poor healing of wounds, and spontaneous bleeding occurs into gums, skin, joints and muscles. Treatment with large doses of ascorbic acid is rapidly effective. a condition in which the blood capillary walls become fragile, leading to excessive bleeding and anaemia, spongy gums with tooth loss, impaired wound healing and eventually death. Scurvy is due to a lack of ASCORBIC ACID in the diet, normal health being restored by administration of fresh fruits, particularly citrus fruits. English sailors on board ocean-going ships of the 18th and 19th centuries were supplied with citrus fruits to prevent scurvy, this habit giving them the nickname ‘limeys’. Disease marked by inanition, debility, anemia, and edema of dependent parts; sometimes causes gum ulceration and loss of teeth; due to a diet lacking vitamin C.
n (scorbutus), a condition resulting from an ascorbic acid deficiency that is severe enough to desaturate the tissues. The development and manifestations depend on tissue storage of ascorbic acid and factors that influence the rate at which it is used in or released from the tissues. Manifestations of frank scurvy include weakness, poor wound healing, anemia, and hemorrhage under the skin and mucous membranes. Presence or severity of gingival changes is directly related to the presence of local irritants such as calculus. In a severe form and in infantile scurvy, painful subperiosteal hemorrhages occur. n a nutritional disease of infants caused by a deficiency of vitamin C in the diet. It has the same symptoms as scurvy does in adults. n See purpura, idiopathic thrombocytopenic. the disease caused by a nutritional deficiency of ascorbic acid (vitamin C). See also ascorbic acid nutritional deficiency.